SUPERHITS OF NIMMI compilation was launched by the veteran actress Nimmi herself at her Juhu residence. The 85 year old actress was thrilled to watch the compilation of 35 songs from her memorable films of the 1950s like BARSAAT, AAN, URAN KHATOLA, DAAG, AMAR, DEEDAR, BHAI BHAI, SAZAA etc. She thanked Shemaroo Entertainment Ltd. for releasing it on its Youtube Channel FILMI GAANE and said that it will not only refresh her memories in the minds of her fans but also introduce her to the new generation who also love to watch the classic retro songs on Filmi Gaane. Our team gifted her rare photographs of her stardom days from our collection. 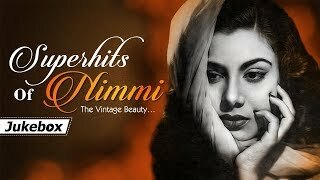 Watch this unique jukebox presenting various songs picturized beautifully on the vintage beauty of Bollywood - Nimmi. Have a great musical time watching her mesmerizing performances.